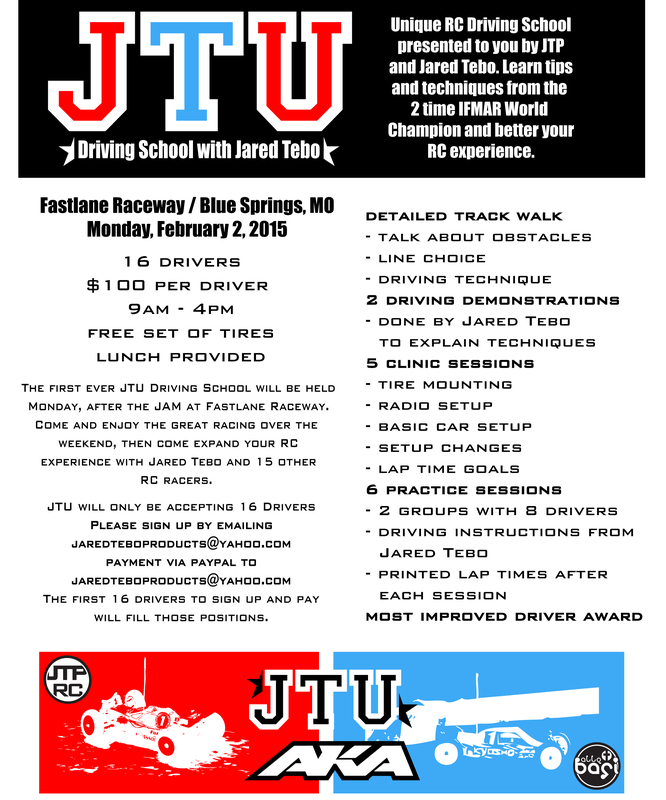 I will be hosting my first JTU driving school on Monday, February 2, 2015 at Fastlane Raceway. Here is the official flyer. Very cool concept and I wish you much success with it. If I was local, I would join. Therefore; what about doing an online driving class as well. Talk about the techniques, obstacles, maintenance, lines, have a Q & A session, etc. This is something I, and I’m sure a lot of other drivers would be interested in. Sounds like a cool program. I have taken private pool lessons in the past and with the right instructor it is a game changer. Hi Jared, what do you think about the 2015 worlds being on carpet? Are you going to try a DB1 or DB2 conversion? I’m up for trying astro. No I will not be trying those conversions, I can’t only use Kyosho cars and parts. …you will likely be quicker in 2wd with a ZX6 with front driveshafts removed…unless a 3 gear transmission is in development…!? Motor inertia reaction makes a HUGE difference to on power steering on astro. I was shocked.